Set in an idyllic country location, Crowbank provides deluxe kennels and the highest standards of care for your canine companions. With three walks daily, one-on-one play, and bed-time stories, your pet will enjoy their holiday as much as you! Crowbank Kennels is located just outside Cumbernauld. Our seven acre site is surrounded by forests and the hill-top location offers beautiful views into the valley below. At the same time, we are just minutes away from Cumbernauld, and 30 minutes from Glasgow city centre. We have completely renovated the kennels to the highest possible standards; from floor to ceiling, the kennels present a clean, cheerful and welcoming environment for our boarders. Each kennel includes an inside and an outside run, bedding, and toys. Covered outdoor runs, for protection from the elements. Our large, enclosed outdoor paddocks offer room to run, and make an excellent place to chase a frisbee or a tennis ball! Crowbank guests each receive a minimum of three walks daily, individual play time, a bed-time story and an evening cuddle from the owners before bed. The kennels are owned and operated on a full-time basis by husband and wife team Fiona and Eran. They will welcome your dog when they check in, and tuck them in each night of their stay. Our experienced staff ensure your dog is well cared for and attended to at all times throughout the day. You can read more about the owners here. We stock eight premium brand dry, canned, and pouched dog foods, including wheat and grain free options, as well as a small range of senior, puppy, weight control, and sensitive food. We also regularly cook for the dogs, making pasta, rice, chicken, fish and mince as required – at no extra cost! All food and treats are included with the stay, but you are welcome to bring your dog’s own food with you if you prefer. The only kennels my dog likes amazing would recommend x. The following table shows our daily routine which includes two meals and at least three walk/exercise sessions. 21:30 – 22:00 Bed-comfort round with toileting, cuddles, and treats for everybody! Your dog’s comfort is very important to us. 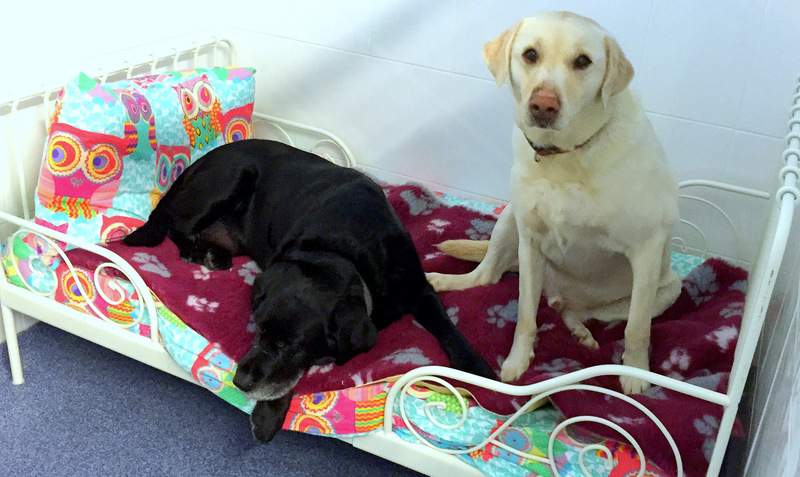 We have a range of different beds, sure to suit your dog’s individual needs: plastic “tub” beds, raised Koolaroo beds, and memory-foam-filled Dog Doza cushion beds. All beds are covered by high-quality vet bedding and blankets. We cannot accept beds or bulky blankets. Small blankets or comfort clothing items are welcome! We post videos and pictures of our boarders on our Facebook page. It’s an excellent way to keep in touch with your loved one; if you miss your furry baby and would like to see a photo – just send us a message! Your dog must have a full and up-to-date set of annual vaccinations, including Kennel Cough. Please e-mail us a digital photograph of your dog’s vaccination card, or bring the card with you when you drop them off. All dogs should be wormed and treated for fleas prior to visiting Crowbank. All medicines should come in their original packaging and be clearly marked with the dog’s name. Directions for the administration of medicines should be written down by the owner and will be checked with the owner on arrival. If your dog is on a special or medical diet, please bring sufficient food with them for the duration of their visit with us. We have a local pick-up and drop-off service available, please call us on 01236 729454 for details.